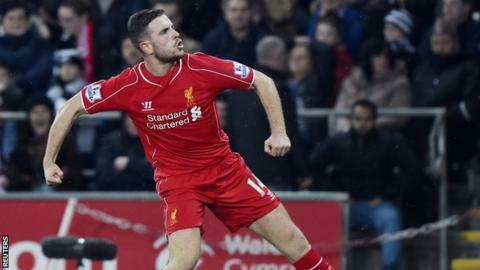 Liverpool midfielder Jordan Henderson has signed a new five-year deal, worth £100,000-a-week. It ends months of talks between the parties, with the ex-Sunderland player committed to the club until 2020. "There has been talk about it for a while now," the 24-year-old told the club website. "It's brilliant news for me to commit my future to this football club. I think, over the next few years, we can challenge and start winning trophies." Liverpool's hopes of winning a trophy this season ended when they lost to Aston Villa in their FA Cup semi-final last Sunday. "We've improved massively over the last few years, and I think the next phase for us is to start challenging for titles and trophies as well," added Henderson. Liverpool also tied down striker Daniel Sturridge and midfielder Philippe Coutinho to new deals earlier this season. Manager Brendan Rodgers said: "The owners are committed to creating a team that can grow, improve and ultimately win together. "We have seen some very important contract renewals this season and I'm confident, under [chief executive] Ian Ayre's stewardship, we will see further commitments made and more exciting talent secured and added to our squad." England international Henderson joined Liverpool from the Black Cats in 2011 in a deal worth around £20m. The vice captain has scored seven times in 55 games for Liverpool and England this campaign.